I took my obsession with Vietnamese food on the road a couple of months ago. I spent a glorious 10 days in sweltering Vietnam, immersing myself in the fresh, aromatic herbs and heady flavors of the cuisine. My experience with Vietnamese cuisine has been limited, and runs mainly to phở (beef noodle soup), gỏi cuốn (summer roll) and bánh xèo (rice crepe). All of which are wonderful ambassadors of the cuisine and I imagined that I would find exceptional examples of them in my journey, but I ended up discovering new flavours and taste sensations. My hunt for the perfect bowl of phở morphed into a celebration of Vietnamese salads. 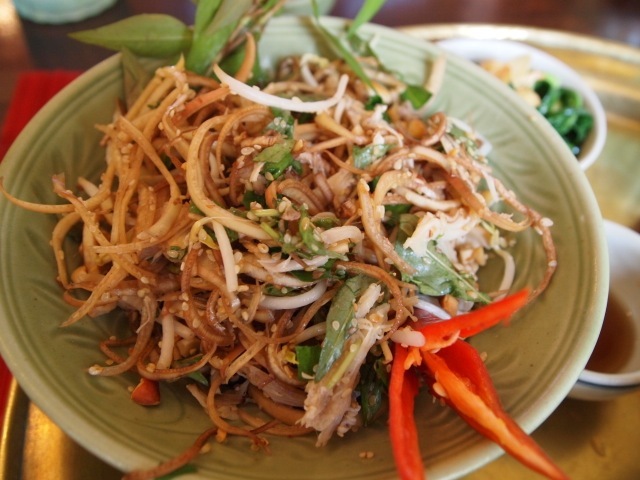 Vietnamese salads are known as nộm in the North, and gỏi in Southern Vietnam. I just call them plain delicious! 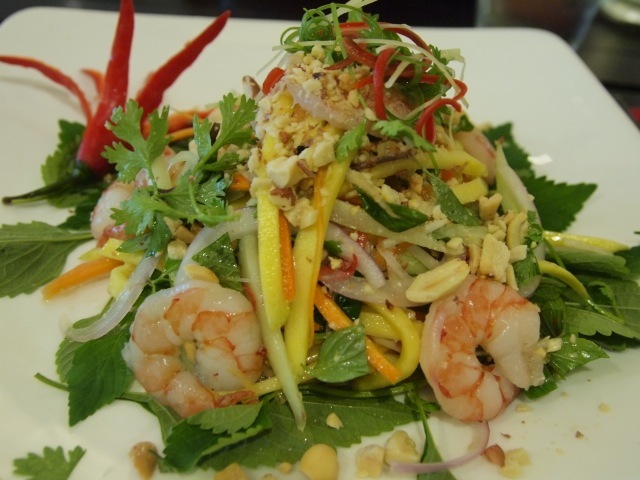 Vietnamese cuisine has an exhilarating range of salads focused on the use of ingredients such as banana flower, green papaya, green mango and pomelo. Wikipedia mentioned specialty salads which uses lotus stem, jackfruit, duck feet, jellyfish and eel; unfortunately, I never saw these on the English menus. The ones I did taste were spectacular; pomelo is reminiscent of grapefruit, though sweeter, and lends a juicy tartness to the salad. Banana flower is the blossom of the banana plant, the purple structure hanging off the base of the stand of banana bunches. The parts used in the salad are the thinly sliced immature leaves of the banana flower; the immature floral bracts themselves, which are sandwiched between the leaves, are discarded. The texture is chewy, with a slightly resin-y, pleasant complex taste. The sliced banana flower oxidises quickly, so they are dipped in limewater to stop this. Green papaya and green mango are firm, immature fruit. The shredded fruit has a chewy-slightly crunchy texture with a hint of the sweetness and fragrance that will develop. These make a great carrier for the punchy fresh burst of flavours from the herbs and nước chấm dressing. 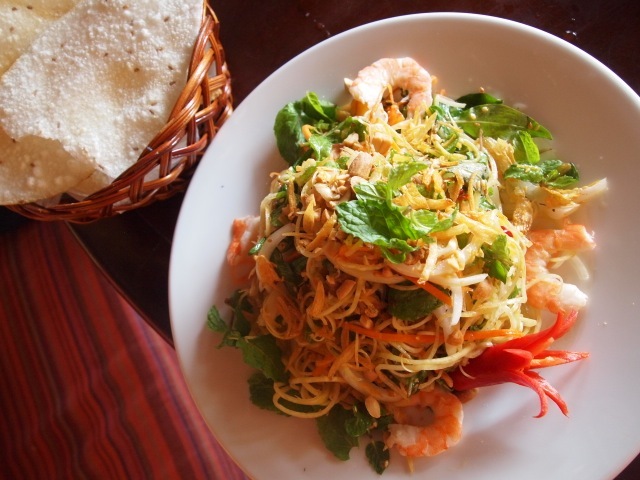 These salads can be served with small amounts of meat or poached prawns; and some places serve these with prawn crackers. At the Gioan Cooking class in Hoi An, our tutor taught us the secrets to making a green papaya salad. The most important part was to get the vegetables need to be as dry as possible. Toss the grated papaya and carrot with the vinegar. Put in muslin cloth, and squeeze as much liquid out as possible (it is astounding how much water you get out). This should be reasonably dry, and can be kept in a container the fridge for up to 5 days. Heat oil on a medium flame. Add paprika, stock powder, sesame oil, spring onion and stir for 30 seconds. Remove from heat and add the dressing. Cool. Just before serving, toss the dressing with the dried papaya and carrot shreds. Mix the shredded mint and sesame seed through the salad. Garnish with peanuts and onion flakes.